Lilya Kas'yanova, one of Kyrgyzstan's finest guides, is passionate about the history, art and craft of her country. A graduate in Linguistics and Intercultural Communications from I. Arabaev Kyrgyz State University, she is also a keen photographer and hiker. 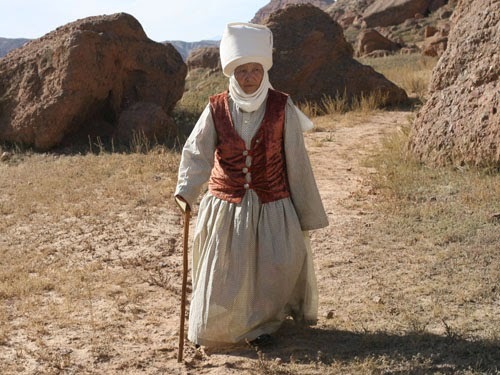 In this article Lilya, who regularly leads Uzbek Journeys tours in Kyrgyzstan, provides an overview of the traditional Kyrgyz headdress, the customs associated with it and regional style variations. Part 2, to be published next week, will describe present-day efforts to keep this tradition alive. In particular, Lilya wishes to express her profound gratitude to Aidai Asangulova for providing much of the information for these articles. Kiyiz duino festival, Southern Kyrgyzstan. Image by Erkin and Arthur Boljurovs. 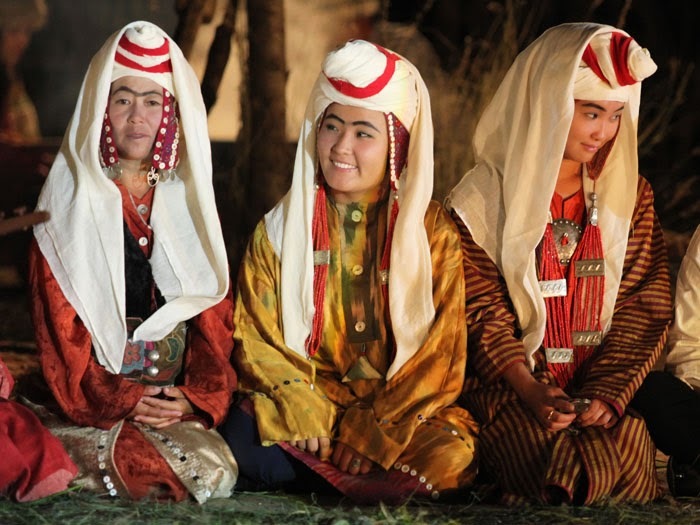 The magnificent, traditional headdress of Kyrgyz married women, wound like a turban, is known as elechek. The shape of elechek varies from simple wraps to quite complicated ones, depending on which region of Kyrgyzstan the woman lives. An elechek may include a cap-takiya (or chach cap), which is a tiny helmet-like bonnet that fits tightly on the head. There is an embroidered kuiruk (fabric strip) at the back to cover the woman’s plaits. Soviet scholars believed that cap-takiya and kuiruk are relatively later additions. Cap-takiya can be supplemented by jaak (earflaps) at the sides. Silver pendants with corals adorned the base of the jaak. A rectangular piece of fabric, covering the neck and affixed under the chin, is placed on top of the cap-takiya. Then a white cloth is used for winding the turban. Wealthy Kyrgyz women used twenty five – thirty meters of snow-white fabric. Middle class women settled for five – seven meters of cloth. 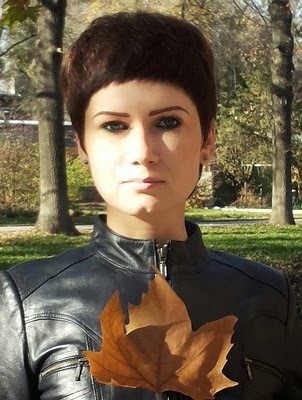 A particular type of decoration – kyrgak - was fixed on elechek. The kyrgak was a silver plate on which could be added corals, pearls, and other semi-precious stones, coins, or silk ribbons and embroidery. In addition to all the parts listed above, a fine, ornamented shawl could be rolled over the turban. As mentioned above, elechek is for married women. For the first three days of married life, a woman wore a headscarf. Then rituals that emphasised the woman’s transition to married life accompanied the change from scarf to elechek. At this ceremony, the elechek was wrapped by a senior woman, usually the bride’s senior sister-in-law. As the elechek was wound around her head, other women would sing wishes for the bride’s happiness and prosperity. They also urged the young woman to respect her seniors. Tunduk - Northern elechek. Image by Erkin and Arthur Boljurovs. An elechek was worn year round. It had to be worn in the presence of the father-in-law and brothers-in-law. Even when making a fire and cooking, indeed when doing any household chore, women wore it. It was unacceptable to leave a yurt, even to get some water, without putting it on. It was said that if an elechek was removed from a woman’s head, she would be deprived of dignity and respect. Elechek also had a practical use. In the event of being away from home, a woman, who had just given birth, could unwind her elechek and use the fabric to swaddle her newborn child. As circumstances required, a snow-white elechek could be used as a shroud for someone who had passed away during a nomadic trip. At times, the next-of-kin of a deceased woman preserved the elechek as a family heirloom. In some cases, it was possible to see elechek among funeral accessories. Although still worn into the early 20th century, it was gradually replaced by simple head scarves. On special occasions and festivals it may still be worn, however, most modern elechek are not authentic - a cardboard frame is wrapped in fabric. In the past, her headdress could determine a woman’s tribal affiliations. 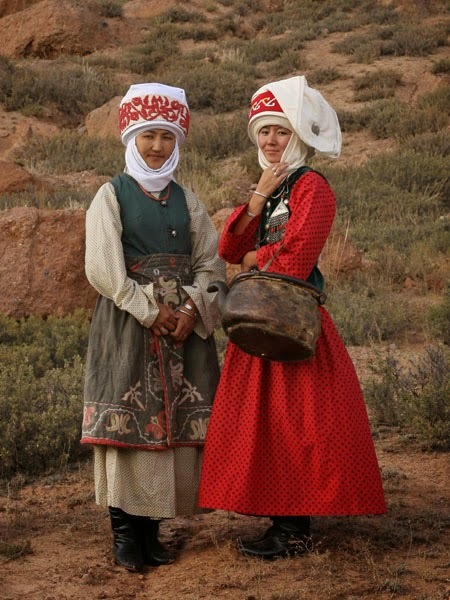 In northern Kyrgyzstan, an elechek consisted of the following parts: a tiny, helmet-like bonnet with a fabric strip at the back to cover plaits. The turban was placed on top then covered by fine white cloth. The northerners wound it in spirals – thus the elechek was cylindrical. The end of the cloth then hung on the left side affixed with a pin. (See the photo at right). In the northwest, the headdress was called an ileki and was either round or oval. The massive upper part and rather small forehead band were regional identifying features. 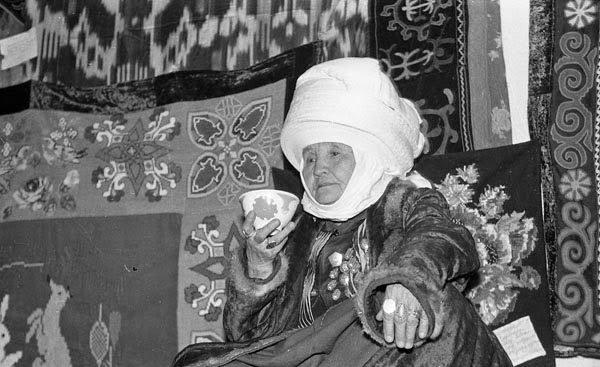 Historical records show that in Osh province, in southern Kyrgyzstan, the headdress, known there as kelek, was enormous with an impressive forehead roll. Sometimes, a duriya (fine shawl) was placed over the turban. The second part of this article will outline other headdress variations as well as describe present-day efforts to keep this tradition alive. Uzbek Journeys specializes in small group tours to Uzbekistan and Kyrgyzstan, focusing on the region's remarkable historical, cultural and architectural legacy. This website is also a repository of articles about Uzbek and Kyrgyz arts, history and society, with occasional nods to other Central Asian and Caucasus countries.